I'm trying to figure out the best UX for the following situation, in which we are developing a mobile application that will work with the database from an existing web application. 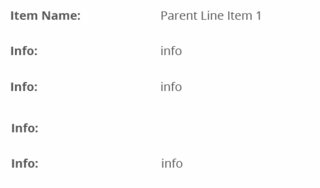 Note how some line items have child line items (like if the parent is a package, and the child line items are the items inside that package). Very easy to represent that in a table. 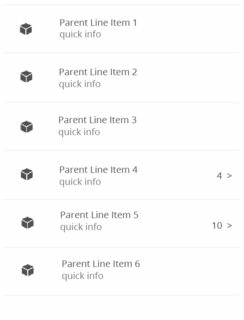 Then you can tap one of the child line items and it will shift to show the information about that line item, or you can tap the back arrow to go back to the parent line item list. So for line items without child line items, it's easy. Just tap the line item (anywhere) to view info about that line. 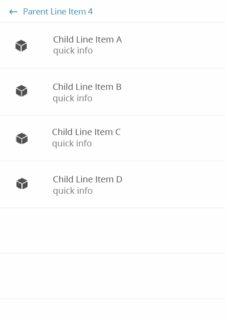 But for line items WITH child items, you'll need to still be able to tap the line somewhere to view info about just that line, but then a second tap area to shift the list over to view child line items. 1) Initial feedback from beta testers is that the quantity and > icon are confusing to them. They don't get the idea that tapping that means it will let them view the child line items. 2) Most mobile apps will use the > icon to indicate that tapping a line item will shift the screen to show more info or open that item. Right now, we only use the > icon to show that you can shift the list to show child line items. So I worry that the way we are doing it isn't consistent with design standards and how most apps work. 3) Right now this just represents simple viewing on the mobile app. But in the future we want to implement editing and other advanced features. Again, most apps I see will use some sort of "..." in the right-hand side of the line item to indicate "more options" like editing the line, deleting the line, etc. So I'm worried that the space we currently have the quantity and > icon will be better used for something like a "..." menu in the future. Has anybody dealt with something similar when designing a mobile app? How did you handle this? I think you are thinking a little bit too complicated. The usual approach here would be to make use of a classic drilldown menu, which in principle tackles the problem of showing hierarchical data on limited screen space of mobile devices by chunking the hierarchy of your data into multiple levels of screens – one for each depth-level. It is in my opinion the only way to show hierarchical data on mobile that works well and is broadly understood. 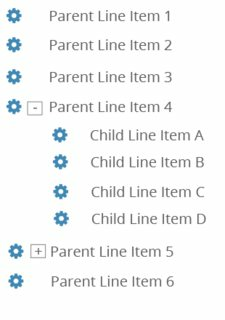 Instead of showing the right-arrow only for items that have children, you will need to show it for every item, as you would have to indicate that each option is going to send the user into a new view, further down the hierarchy. If your item has children, you would show these children when you are on this item's screen. Since you also want to show information about the parent itself, you need to find a proper way to indicate the availability of these children as well. This could be done using a tab mechanic, but it really depends on the shape of the information displayed on that screen. It could be enough to just show it one below the other as well. If you want to inform your user that an item has children at the top level, I think you are best off using a (dimmed) textual indicator next to the item title on the left, eg. "+4". That way you can also save space for the context menu on the right. In any case, the user testing already showed you that you are sacrificing expectability when you are challenging broadly used conventions, which is why you should always look for solutions that conform to principles that users already know from other places. Not the answer you're looking for? Browse other questions tagged mobile tables help or ask your own question. How should I indicate to a user that they've already viewed an item? Design pattern for working with data driven lists in a mobile web app? Same gesture for multiple actions in a mobile app? 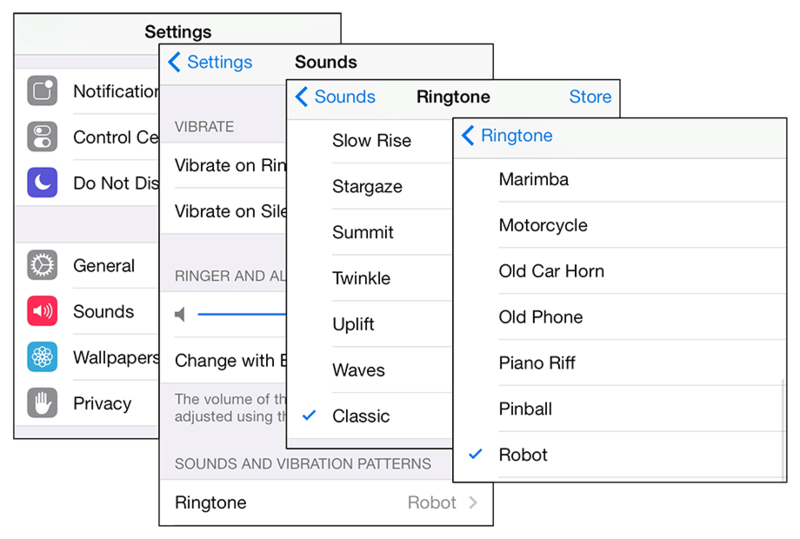 Radio button the best choice? Best practice/guidelines for performing action(s) on *all* list items in a mobile app? On mobile web app, where should primary & delete buttons go?